The private enterprise "UAR" is the largest in Ukraine producer of such building material as lime paste. We have been working in the market of lime paste already for more than 10 years, and we are located in the city of Mykolayiv. During this time we have earned our customers’ trust, which we have at present more than three hundred across all Ukraine. We really appreciate all our customers very much, and we value each one individually. No other manufacturer of these goods in Ukraine has such large volumes of production and sale as we do. Having our own fleet of auto trucks, we can deliver our products to any place of our country. 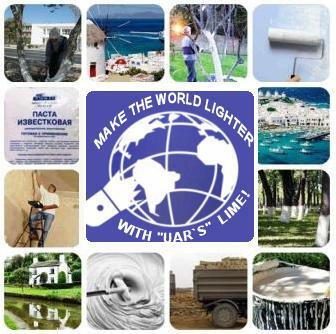 It is not a problem for us to deliver 10, 20, 30, 40 and more tons of lime paste to any region of Ukraine. At present we are packing up the lime paste into packets of 2, 3 and 4 kg, and also into bags of 20 and 40 kg. The packets are additionally packed into packs what provides double reliable packaging and almost eliminates breakage of the products. In addition to the lime paste, we also sell lump (unslaked) lime in bags of 50 kg. We are looking for potential dealers in all regions of Ukraine, especially in the regions of Kyiv, Ternopil, Ivano-Frankivsk, Khmelnitskiy, Sumy, Lugansk, Donetsk, Zaporizhzhya, Chernivtsy, Zakarpattya, Lviv. If you work in these regions, you have a unique opportunity to become a sales representative in your region of the largest producer of lime paste in Ukraine. We will be pleased to receive your proposals about business cooperation.